IT reduces resistance and streamlines breast imaging workflow. A streamlined fetching solution sounds like a new method of dog training, not a component of an enterprise software system that takes images and data from disparate imaging centers and combines them into a seamless workflow. However, combining images and data from different systems is the process that many breast imaging enterprises are adopting as they look to expand regionally, comply with regulatory standards, and provide services to patients. As more facilities expand through mergers and acquisitions, they're learning how IT can bridge the gap between different systems and streamline workflow among multiple facilities and modalities while maintaining a high level of customer service. "Women's imaging has changed dramatically over the last five years," says Dean Kaufman, principal at Healthcare Service Consultants. "There are increasing numbers of new technologies. Women are getting digital mammograms, and they're now often having other images taken with adjunct modalities at the same time." A number of factors speak to why IT solutions are needed in the fetching, storage, and distribution of breast images from various sources. Typical digital breast tomosynthesis (DBT) studies average in size from 450 MB to 3 GB. Large files take longer to transmit and require large amounts of storage space. In addition, the Mammography Quality Standards Act classifies original mammograms and their reports as medical records. As such, a facility must "maintain mammography films and reports in a permanent medical record of the patient for a period of not less than five years, or not less than 10 years if no additional mammograms of the patient are performed at the facility." Whether it's file size, number of prior images, or number of workstations, imaging archives are filling up, and image sharing has become more complicated. The radiologists and IT experts at Baptist Health, a multihospital health system that serves south central Alabama, have a clear perspective on the need for streamlining workflow in the face of merging practices and meeting patient needs. The breast imaging services provided by Baptist Health include double reading of all diagnostic exams at one location and offering same-day reports at another location. They also welcome walk-in patients. Like many large medical facilities, Baptist Health grew regionally through acquisition. Their women's imaging service expanded to provide more than 45,000 studies annually, operating three outpatient breast imaging centers, with image reading performed at two of those centers. What didn't come with the brick-and-mortar purchases, however, was the means to integrate the site-specific imaging workflow from these new centers into Baptist Health's existing PACS and image sharing system. The challenge was to merge workflows and, hopefully, do so with automated solutions, rather than time-consuming manual tasks. "Unlike most organizations, Baptist Health had varying requirements for data ingestion and timely sharing across disparate locations and systems," says Greg Muller, director of business development for Laurel Bridge Software. Muller explains that Baptist Health was having difficulty accessing breast imaging priors after undergoing business expansion. Images from different centers were being stored in a centrally located PACS, but not all images were readily available in their existing electronic ordering system. There was also no electronic trigger for retrieving historic images. Baptist Health implemented Laurel Bridge's enterprise imaging software applications for unified data identification, retrieval, and distribution across its three breast imaging centers. The system expedites the retrieval of relevant prior images; images from previous studies can be retrieved in advance of scheduled appointments or pulled on an as-needed basis for walk-in patients. "Previously, a tech assistant would have to go into our PACS and push prior images to the right workstation," says Tina Hodge, BSRS, RT(R)(M), breast health clinical operations manager at Baptist Health. "That's a time-consuming process of locating the right images and sending them where they need to go. Now, we can have images pulled in advance for patients who have scheduled appointments or fetch images for walk-in patients when they arrive. This takes the manual process out of our workflow." This streamlined system allows for customization to the workflow at each of Baptist Health's breast imaging centers. Hodge says their radiologists can read current images and compare with priors in about 10 minutes. "Laurel Bridge gave Baptist Health the ability to ingest a schedule for the day, build a worklist of orders, and then automatically fetch prior images for those orders," Muller says. "The presence of a patient on the worklist triggers the fetching solution that retrieves the relevant prior images and delivers them to the appropriate reading workstations." Part of integrating operations from different centers for Baptist Health included unifying the medical record numbering (MRN) methods of each center, as well as their different PACS. Migration to a new central PACS was easily completed, but patient identification numbers were not adjusted, meaning one patient's studies could have different MRNs, making it difficult to identify, retrieve, and distribute all of the patient's prior and current images to the radiologists for comparison. The new system enabled Hodge to add a prefix that prevents the records from merging and allows users to fetch the records that are new to their system. "We make the rules that enable us to send images to the proper workstations, and we can change the rules when we need to," Hodge says. "We can prefix the images so that they appear unique in the system and can be tagged to the proper patients. With customization, we can categorize images per site. And all images live on the same server, so they can be retrieved and sent to the correct workstation for reading purposes." Muller explains that the workflow is designed to find where, how, and when to look for priors. User-defined rules are configured to identify the fetch process triggers used by archives to search for relevant priors, query source archives, and send relevant prior exams based on granular relevancy criteria, eg, age of study, modality, and body part/synonym body part. Relevancy of data is defined by the workflow. Priorities can include parameters such as oldest images first or the last three images. Searches are then filtered based on the relevancy rules that have been set. The amount of time the fetching process takes depends on the size of the files, the current load on systems and workstations at time of prior exam fetching, and network bandwidth. When sorting where images should be sent, the system takes modality into consideration, sending 3D images to workstations that can view 3D and 2D images to 2D workstations. There is not a lengthy assessment and validation process associated with system configuration. Also, the rules are controlled by the user. There's no need to send a work ticket to the vendor to make tweaks to the system. Workflow can be implemented or modified within minutes, not days or weeks. "If there's a problem, I'm able to go in and fix any issues," Hodge says. "I don't have to call tech support. I can check and see why something didn't go to the workstation as it was expected to. Maybe that patient had no prior images, for example. Or maybe a synonym body part was typed incorrectly or missing from the synonyms tables, which prevented the image transfer from occurring." Add to that the need to share large, complex files, such as those created with DBT, computer-aided detection, and breast density software, as well as screening and diagnostic mammography services. Storage is a factor as well. At Baptist Health, the system automatically detects when storage space reaches a predefined level. Hodge receives an alert and can then adjust the amount of time an image is stored, in order to free up space. "This is all kept on a virtual server, so you forget that it's there," she says. She adds that the software was configured one day after closing, and Baptist Health went live the next day. "I can see that in the future, if we add more facilities, the system would just expand with us," Hodge says. IT is vital in the expansion of business offerings, as evidenced at Elizabeth Wende Breast Care (EWBC), which serves more than 100,000 patients per year at one main imaging center in Brighton, New York, and four satellite centers. Radiologist Stamatia Destounis, MD, FACR, FSBI, FAIUM, says the distance between centers runs anywhere from 20 minutes to one hour. And as the clinic looks to expand even greater distances, having an IT network that connects them is important. "We're totally digital, and, with technology like DBT—3D mammography with C view—screening breast ultrasound, and breast MRI, you need to be able to transfer the large files generated by this technology," Destounis says. "We would not be able to expand without IT. We wouldn't be able to read images while patients wait without a robust PACS that communicates with our RIS. We can ask for extra views right away, if necessary. We can give patients their results right away." According to Diana Frillici, EWBC PACS administrator and IT manager, a streamlined workflow relies on bidirectional communication between an imaging center's PACS and RIS. EWBC uses Sectra PACS and a proprietary RIS called Avairis, which Frillici refers to as "homegrown," as it is customized to meet EWBC's needs. "We feel this is better than using a 'canned' RIS," Frillici says. "It's important to have customization capabilities." Storage space is also a key to successful data sharing and merging. 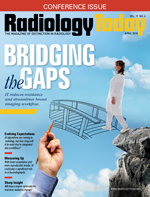 Destounis, who is also a member of Radiology Today's Editorial Advisory Board, notes that while bandwidth is expensive, it's necessary to maintain a high level of customer service across multiple locations. "Medical information such as a patient's medical history and biopsy information need to be available to the doctors as they review a patient's images," Destounis says. "If you think you see a scar on the image, you can go back to the RIS and check the patient's medical history, to see if they had previous biopsies or other surgeries that would create the scar." The IT issues are similar for radiologists at the Hospital of the University of Pennsylvania (HUP) and Penn Medicine, which operates 16 radiology practice locations in Philadelphia and its surrounding suburbs. Emily F. Conant, MD, chief of the division of breast imaging at HUP, says managing images throughout their community and tertiary care centers is a huge challenge. "Breast imaging in particular has become a more multimodality discipline," Conant says. "A patient who comes in for a mammogram at one site may have had prior imaging at another site, and having access to all those images is critical—sometimes even if those images aren't breast specific. For example, for a woman with axillary adenopathy, I need access to any studies that may have the breasts and axillae, such as prior chest CTs. It's important to have an enterprisewide PACS that allows radiologists easy access to all of the patient's images on one workstation." Conant says Penn Medicine began using DBT in 2011, and file size and storage immediately became issues. "We had to make decisions on what to save and for how long. We were also dealing with multiple DBT vendors, which can make it difficult to access images captured at different locations." Dan Morton, clinical imaging architect at Penn Medicine, says that a first step in any attempt to streamline IT processes for image management is standardization. Proprietary vendor-specific formats become stumbling blocks for image retrieval from various medical facilities within one network, particularly when the process is being done manually. "Images are taken with a variety of modalities and different vendors," Morton says. "Having DICOM-standard breast tomography object [BTO] format has made it possible to better share images across multiple facilities." Initially, Penn Medicine created vendor-neutral "mini PACS" for distributing images to and from other centers. Morton says they now use Sectra PACS and a central archive. "As a tertiary care site, we have a lot of outside images coming in for second opinions," Conant says. "We want providers to easily upload images to the PACS for radiologists to review. Before, we would have to manually query the system to retrieve some images and data related to a patient's medical history. Now we have greater access to the depth and breadth of images and patient data through a unified PACS and a robust RIS system." Both Morton and Conant add that this centralization is improving, but still a work in progress. In some cases, certain images still need to be converted to BTO so that all layers can be seen via the PACS. However, there is significant workflow streamlining over previous years. Another aspect to the streamlining process is a robust EHR. Penn Medicine uses Epic, which Conant says brings together a patient's clinical chart, imaging record, and even pathology. Radiologists can conduct dynamic queries and pull together vital information, which they can then review in conjunction with the patient's images. Patients also benefit from this approach to their care; they can even see their same-day results, sent to their phones for viewing after they leave the center. "We're most proud of the patient engagement piece," says Steve Hyland, Penn Medicine's application manager for Epic. "Patients can even schedule their screening mammograms using an online application." "Any time you can eliminate a barrier to scheduling screening, that's a good thing," Conant adds. "With this online piece, we not only capture more patients, but it empowers patients to take control of their medical care. When the patient is engaged, the health care team benefits."